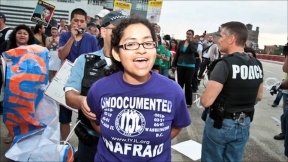 Chicago immigrant rights organizer and educator Nadia Sol Ireri Unzueta Carrasco has received notice that the United States Citizenship and Immigration Services (USCIS) has approved her request for Deferred Action for Childhood Arrivals (DACA). 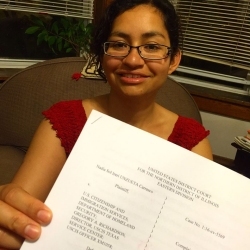 Unzueta Carrasco had previously been denied due to “public safety concerns” cited by the Chicago USCIS Ombudsman related to her participation in various civil disobedience actions for immigrant rights. She now points to other cases of undocumented organizers who are in a similar situation, in particular Lizbeth Mateo, a law school graduate and organizer whose DACA is about to be denied for reasons relating to her participation in direct action in defense of undocumented immigrant youth. Unzueta Carrasco and her attorneys expressed a need for USCIS to evaluate the way they make decisions on DACA cases, particularly when it comes to denials. They point to the case of Lizbeth Mateo, a former organizer and recent law-school graduate from Los Angeles, California, who recently received a second “Notice of Intent to Deny.” USCIS claims she does not meet the requirements for DACA because of her brief absence from the country while she participated in the “Dream 9” civil disobedience, an action that brought national attention to the plight of deported immigrants and their exclusion from immigration reform.